The 3.25″ ‘clickable’ touch screen gives users the sensation of actually pressing down on virtual keys, which also lights up when touched. 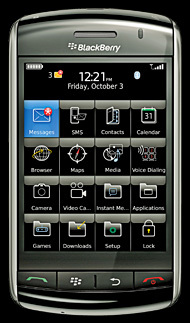 This makes it easy to type texts and e-mails as well as navigate through the phone’s functions. This phone is the most advanced smartphone to date from RIM’s stable and would be positioned globally in competition to Apple’s iPhone, though it would obviously be targeted at business customers. No official pricing details are available yet, but these companies are expected to reveal prices in the coming weeks.